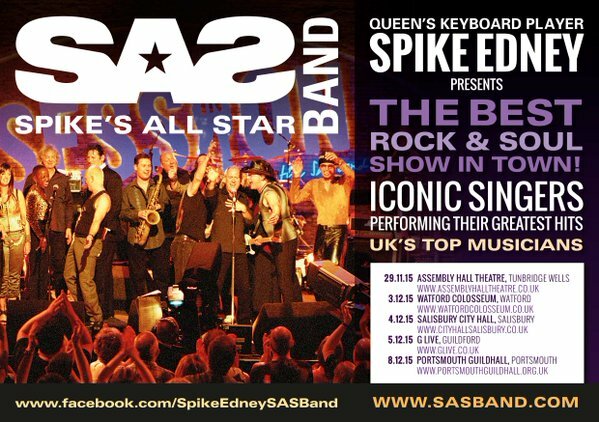 As every year, Patti Russo is coming back to England to join Spike’s All Star Band for their Christmas gigs. This year, you’ll have quite a few chances to catch these legendary gigs around the country, as always bringing you the best rock and soul classics and featuring some of the UK’s top musicians. The SAS band management and all performers will give their services free of charge and donate their box office to Children in Need. Artists announced to date include: Melanie C (Spice Girls), 10cc’s Graham Gouldman, Soul/Jazz Icon Madeline Bell (Blue Mink), Patti Russo (Meat Loaf), Cheryl Baker (Buck’s Fizz), Abba tribute The Fabbagirls. Support Band: Kyla & Nat. Artists announced to date include: Melanie C (Spice Girls), Kiki Dee & Carmelo Luggeri, 10cc’s Graham Gouldman, Soul/Jazz Icon Madeline Bell (Blue Mink), Patti Russo (Meat Loaf), Chris Thompson (Manfred Mann’s Earth Band), Abba tribute The Fabbagirls. Artists announced to date include: Melanie C (Spice Girls), Kiki Dee & Carmelo Luggeri, 10cc’s Graham Gouldman, Soul/Jazz Icon Madeline Bell (Blue Mink), Patti Russo (Meat Loaf), Chris Thompson (Manfred Mann’s Earth Band), Abba tribute The Fabbagirls. Support Band: Drive In Saturday. THE SAS BAND CHRISTMAS SPECIAL. Artists announced to date include: Kiki Dee & Carmelo Luggeri, Soul/Jazz Icon Madeline Bell (Blue Mink), Patti Russo (Meat Loaf), Chris Thompson (Manfred Mann’s Earth Band), Abba tribute The Fabbagirls. Support Band: The Bobbs. This is Spike’s hometown and is the day he’s being inducted onto the Guildhall’s Wall of Fame. Artists announced to date include: Melanie C (Spice Girls), 10cc’s Graham Gouldman, Kiki Dee & Carmelo Luggeri, Soul/Jazz Icon Madeline Bell (Blue Mink), Patti Russo (Meat Loaf), Abba tribute The Fabbagirls. And another five-star review for Patti’s gig in London last week, from Jazz Tangcay on So So Gay. It’s been a long time coming, but Patti Russo finally set out on her first solo tour across the UK. It’s named the ‘How Are Ya, 5-Oh!’ tour because the singer turns 50 next month. Prior to this venture, Russo has spent the majority of her career as a backing vocalist for the likes of Cher and is perhaps best known as Meat Loaf’s female vocalist. She’s also performed alongside Queen and starred in Notre Dame De Paris on the West End. We caught the last night of her tour at London’s O2 Academy in Islington. The venue was intimate, the stage equally so, with Russo and her band and a few hundred people in the audience. She came on stage shortly before 9pm, and her opening number was a cover of Queen’s ‘Don’t Stop Me Now’, which couldn’t have been more fitting. Tonight was the night she stepped out into the limelight to show off her vocal talents as a solo artist, and there was going to be no stopping her. From the get go, Russo was on fire. Her next number was ‘I’d Lie For You and That’s the Truth’, a song she’s always sung as a duet with Meat Loaf, but tonight she sang both parts, something we’re sure the song’s writer, Diane Warren, would be proud of.